The tips and techniques featured inside can be used for current conditions and as preventative medicine. 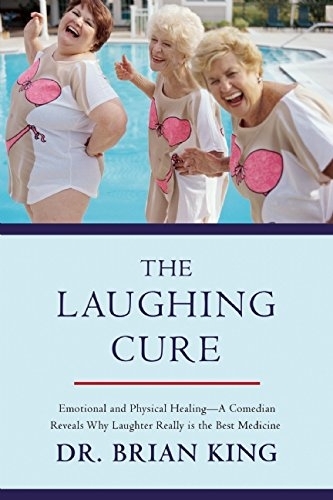 Through humor and science King explains why much–talked-about but little-understood methods of therapy such as laughter yoga actually work and how we can better incorporate humor into our lives. Very few doctors have the ability to heal the way that King does; his method is cheap, easy, and chemical-free. Even fun! This wonderful, transformative, and provocative read shows how—and why—laughter saves lives. “Whether performing stand-up or contributing to the planet’s knowledge of Bloody Marys, King is dedicated to making people laugh from coast to coast. Life got you down? Spend an hour with Brian King.” —Scotch Wichmann, author of Two Performance Artists Kidnap Their Boss And Do Things With Him. Dr. Brian King is an acclaimed comic and public speaker who travels the world as a performer and an instructor, giving seminars to more than ten thousand people each year on the health benefits of humor. King was the founder and producer of the highly reviewed Wharf Room Comedy show in San Francisco; has worked with such talents as Will Durst, Rick Shapiro, Mo Mandel, Laurie Kilmartin, and Steven Pearl; and produces the annual Bay Area comedy competition Walk the Plank. Today King spends much of his time on tour, but is based in Los Angeles, California. I was first introduced to Dr. Brian King through his seminars. The first being about will power and habits, the biggest note I took during that first seminar was “This guy is funny. Recommend him.” And I have. And I am again. Reading this book is much like sitting in on one of his seminars about happiness. The tone is conversational. He breaks down the brain science in to small bites that are not overwhelming to the average Joe or Jill. He also made me laugh out loud reading the book. Not the fake lol, but an actual the person sitting next to me in the coffee shop is staring laugh out loud. I believe being happy is a choice we get to make. I am glad to read a book that reinforces that choice and gives me a list of the benefits of making that choice. Good health and good laughs. What could be better?